Fig.1 Arctic sea ice volume anomaly from PIOMAS updated once a month. Daily Sea Ice volume anomalies for each day are computed relative to the 1979 to 2018 average for that day of the year. Tickmarks on time axis refer to 1st day of year. The trend for the period 1979- present is shown in blue. Shaded areas show one and two standard deviations from the trend. Error bars indicate the uncertainty of the monthly anomaly plotted once per year. Fig. 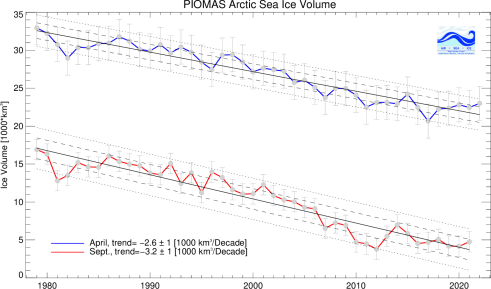 2 Total Arctic sea ice volume from PIOMAS showing the volume of the mean annual cycle, and from 2011-2019. Shaded areas indicate one and two standard deviations from the mean. 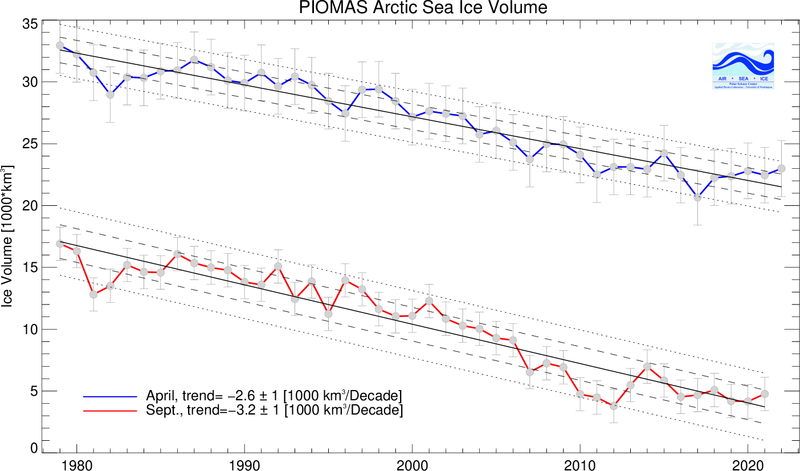 Fig.3 Monthly Sea Ice Volume from PIOMAS for April and Sep. 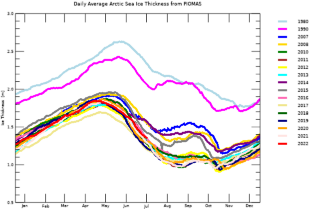 Fig 4.Average Arctic sea ice thickness over the ice-covered regions from PIOMAS for a selection of years. The average thickness is calculated for the PIOMAS domain by only including locations where ice is thicker than .15 m.
Fig 6. 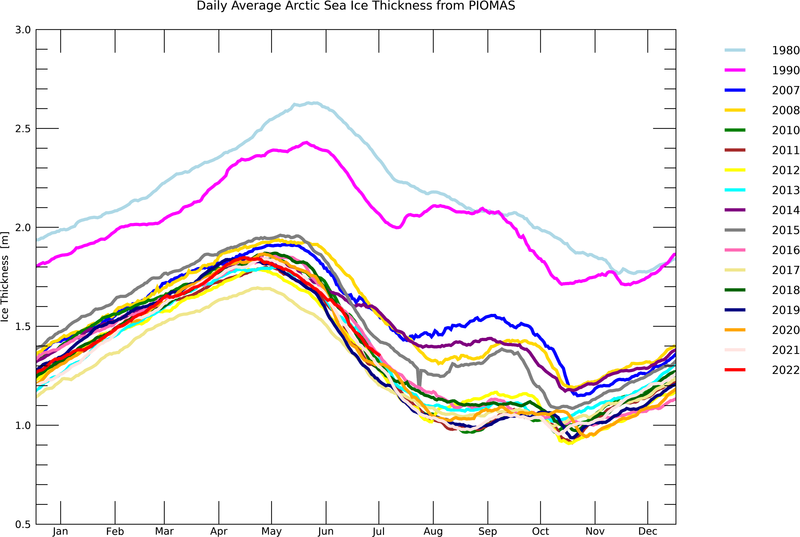 PIOMAS Ice Thickness Anomaly for Feb 2019 relative to 2011-2018. Fig 7. PIOMAS Sea Ice Advection and Ice Motion Anomalies for February 2019. Fig 8 Comparison of Daily Sea Ice Volume Anomalies relative to 1979-2018. Fig 9. 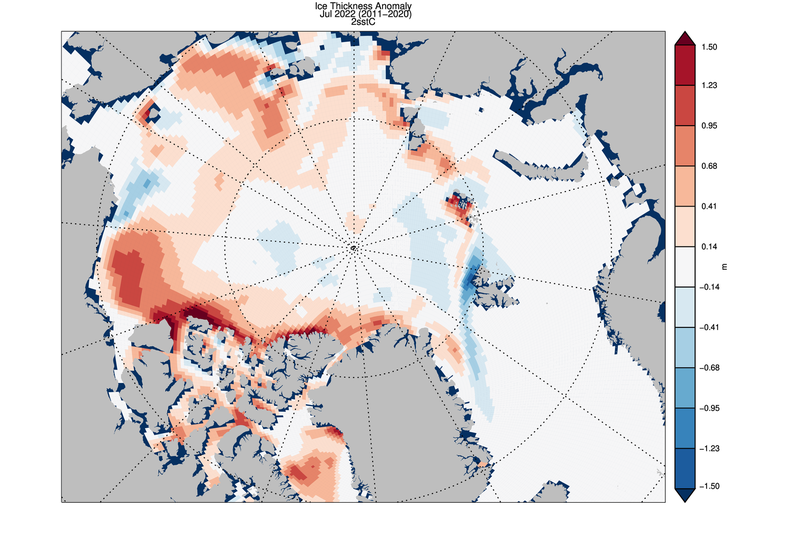 Ice Thickness Anomaly for March 2019 from and CryoSAT AWI (Version 2.1). Data provided by S. Hendricks and R. Ricker at AWI. Fig 10. 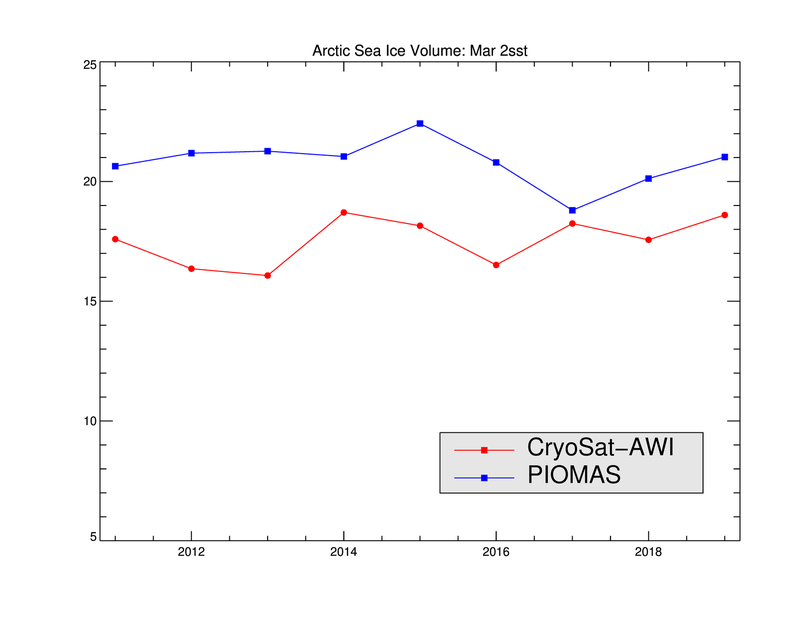 Arctic Sea Ice Volume for Mar from 2011-2019 from and CryoSAT AWI (Version 2.1) and PIOMAS. CryoSat Data provided by S. Hendricks and R. Ricker at AWI. Sea Ice Volume is calculated using the Pan-Arctic Ice Ocean Modeling and Assimilation System (PIOMAS, Zhang and Rothrock, 2003) developed at APL/PSC. Anomalies for each day are calculated relative to the average over the 1979 -2016 period for that day of the year to remove the annual cycle. The model mean annual cycle of sea ice volume over this period ranges from 28,000 km3 in April to 11,500 km3 in September. The blue line represents the trend calculated from January 1 1979 to the most recent date indicated on the figure. Shaded areas represent one and two standard deviations of the residuals of the anomaly from the trend in Fig 1 and standard deviations about the daily 1979-2017 mean in Fig 2. The year 2018 finished out with an annually averaged sea ice volume that was the 5th lowest on record with 13,860 km 3 , with a 1,000 km3 gain over the record year of 2017. While 2018 started relatively low relatively little melt during the summer and rapid growth in the fall (Fig 8), brought the ice volume in the same area as recent low years (2011,2012,2016, 2017). Average Arctic sea ice volume in March 2019 was 21,800 km3. This value is the 5th lowest on record about 2200 km3 above the March record that was set in 2017 with ~19600 km3 . Monthly ice volume was 39% below the maximum in 1979 and 25% below the mean value for 1979-2018. March 2019 ice volume falls above the long term trend line with 0.786 sigma above. 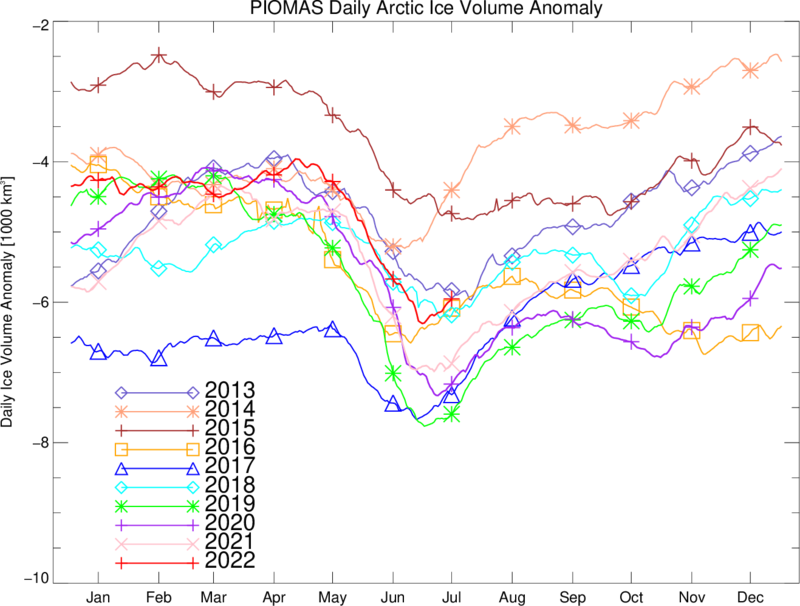 Warm Arctic temperatures during the last part of March show up as a drop in the daily anomalies (Fig 8). Ice thickness anomalies anomalies for March relative to 2011-2018 (Fig 6) continue with positive anomalies in the Eastern Arctic while the Western Arctic shows mostly negative anomalies. Sea ice in the Chukchi just north of Bering Strait is low with due to strong ice advection losses as the ice was pushed northward due to anomalous winds during February (Fig 7) likely contributing to the low sea ice extent in the Bering Sea. 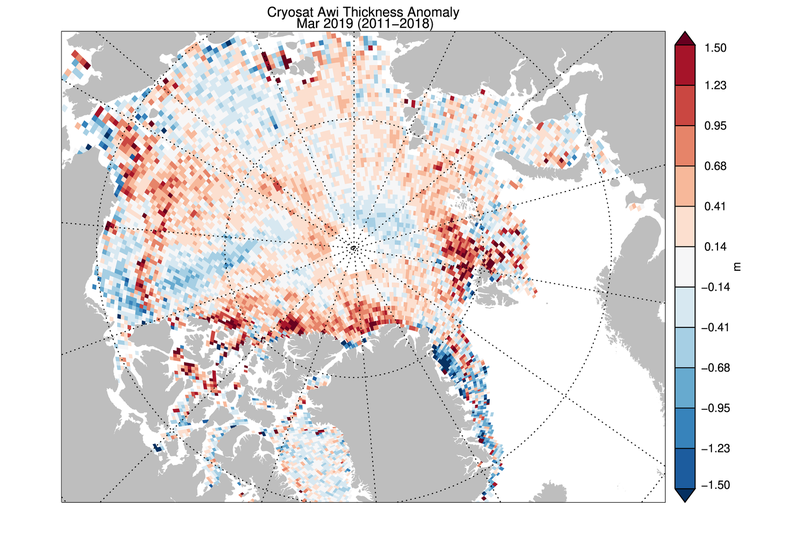 CryoSat thickness anomalies (Fig 9) show a rather different pattern. While CryoSat also shows low ice thickness just north of Bering Strait, strong positive anomalies in ice thickness occur further north. Ice thickness anomalies north of the Canadian Archipelago are positive in CryoSat but negative in PIOMAS. We are currently looking at potential explanations for those differences. PIOMAS and CryoSat time series for March show that sea ice volume has held steady since the exceptionally low values first seen in 2011 and 2012 (Figure 10). Updates will be generated at approximately one-month intervals. Sea ice volume is an important climate indicator. It depends on both ice thickness and extent and therefore more directly tied to climate forcing than extent alone. 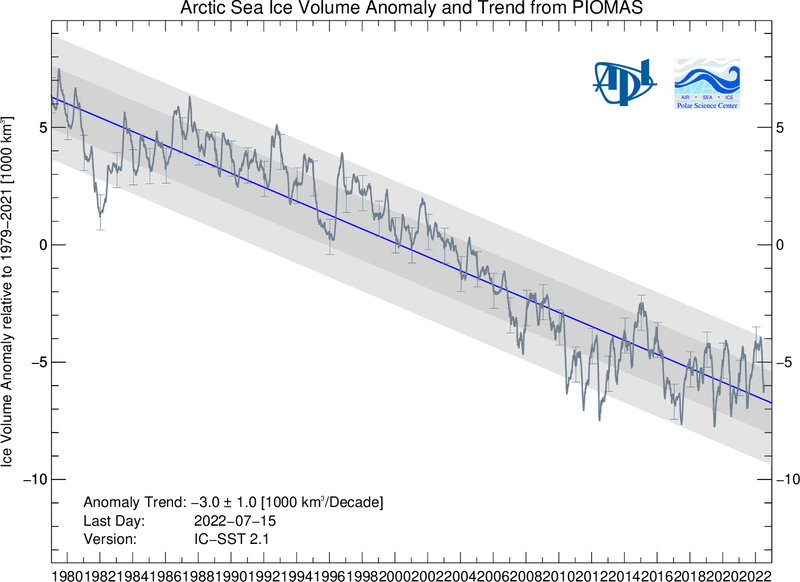 However, Arctic sea ice volume cannot currently be observed continuously. Observations from satellites, Navy submarines, moorings, and field measurements are all limited in space and time. The assimilation of observations into numerical models currently provides one way of estimating sea ice volume changes on a continuous basis over several decades. Comparisons of the model estimates of the ice thickness with observations help test our understanding of the processes represented in the model that are important for sea ice formation and melt. We identified a programming error in a routine that interpolates ice concentration data prior to assimilation. The error only affected data from 2010-2013. These data have been reprocessed and are now available as version 2.1. Ice thickness is generally greater in the Beaufort Chukchi Sea area with the largest differences in thickness during May. 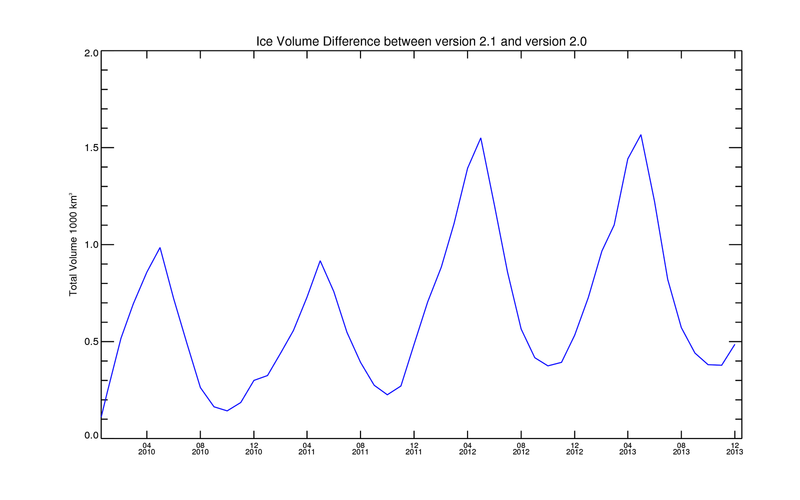 Differences in ice volume are up to 11% greater in late spring. 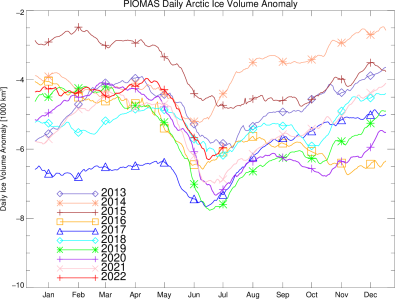 This time series of ice volume is generated with an updated version of PIOMAS (June-15,2011). This updated version improves on prior versions by assimilating sea surface temperatures (SST) for ice-free areas and by using a different parameterization for the strength of the ice. Comparisons of PIOMAS estimates with ice thickness observations show reduced errors over the prior version. The long term trend is reduced to about -2.8 103 km3/decade from -3.6 km3 103/decade in the last version. Our comparisons with data and alternate model runs indicate that this new trend is a conservative estimate of the actual trend. New with this version we provide uncertainty statistics. More details can be found in Schweiger et al. 2011. Model improvement is an ongoing research activity at PSC and model upgrades may occur at irregular intervals. When model upgrades occur, the entire time series will be reprocessed and posted. PIOMAS is a numerical model with components for sea ice and ocean and the capacity for assimilating some kinds of observations. For the ice volume simulations shown here, sea ice concentration information from the NSIDC near-real time product are assimilated into the model to improve ice thickness estimates and SST data from the NCEP/NCAR Reanalysis are assimilated in the ice-free areas. NCEP/NCAR reanalysis SST data are based on the global daily high-resolution Reynolds SST analyses using satellite and in situ observations (Reynolds and Marsico, 1993; Reynolds et al., 2007). Atmospheric information to drive the model, specifically wind, surface air temperature, and cloud cover to compute solar and long wave radiation are specified from the NCEP/NCAR reanalysis. The pan-Arctic ocean model is forced with input from a global ocean model at its open boundaries located at 45 degrees North. It takes energy to melt sea ice. How much energy? The energy required to melt the 16,400 Km3 of ice that are lost every year (1979-2010 average) from April to September as part of the natural annual cycle is about 5 x 1021 Joules. For comparison, the U.S. Energy consumption for 2009 (www.eia.gov/totalenergy) was about 1 x 1020 J. So it takes about the 50 times the annual U.S. energy consumption to melt this much ice every year. This energy comes from the change in the distribution of solar radiation as the earth rotates around the sun. To melt the additional 280 km3 of sea ice, the amount we have have been losing on an annual basis based on PIOMAS calculations, it takes roughly 8.6 x 1019 J or 86% of U.S. energy consumption. 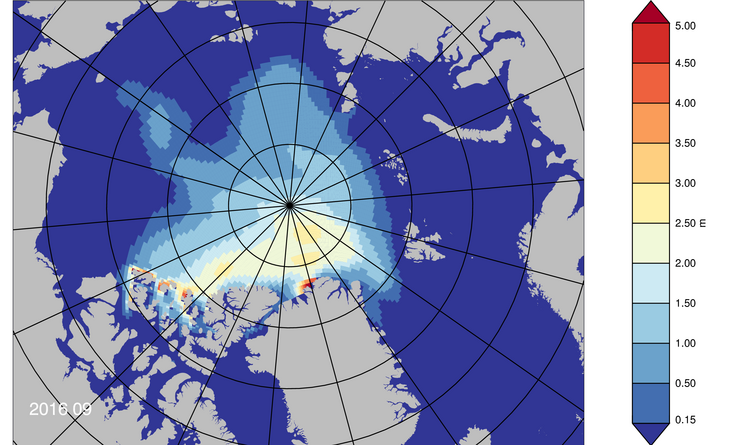 However, when spread over the area covered by Arctic sea ice, the additional energy required to melt this much sea ice is actually quite small. It corresponds to about 0.4 Wm-2 . That’s like leaving a very small and dim flashlight bulb continuously burning on every square meter of ice. Tracking down such a small difference in energy is very difficult, and underscores why we need to look at longer time series and consider the uncertainties in our measurements and calculations. 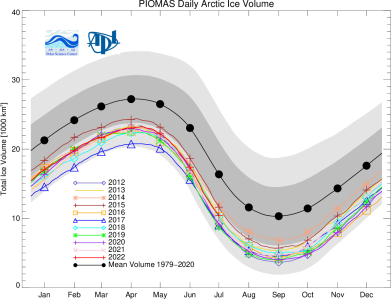 The reprocessed PIOMAS ice volume data (version 2.1) are available (here). The Polar Science Center is entirely funded through grants and contracts from federal and state agencies and private foundations. If you would like to support our research, education, and outreach activities through a personal gift, please talk to us or you can make a donation online.